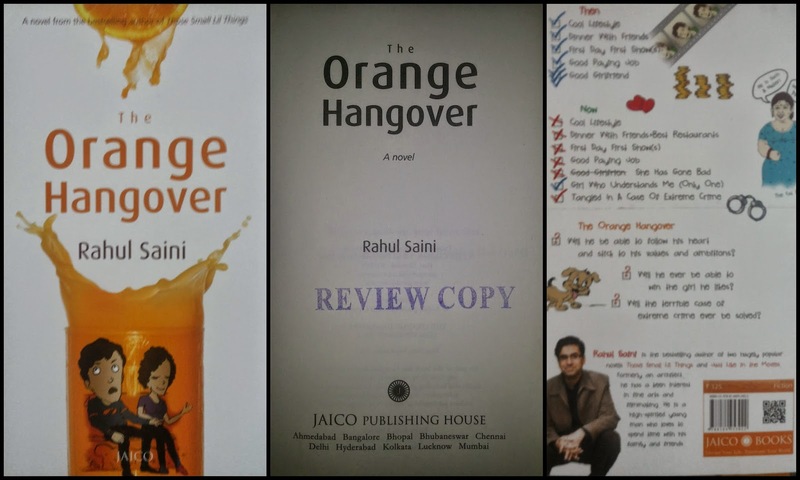 The Orange Hangover, a work of fiction by Rahul Saini, features the story of a young architect who has been lucky enough to have led the coolest of lifestyles, with the best of friends for company, a lucrative job in his pocket, and a girlfriend in his arms. Unfortunately for him, his cool lifestyle is now a thing of the past, as an unforeseen circumstance bundles him off to his small hometown, where good restaurants and cool parties seem to be nowhere in sight. His move also ensures that his friends are a long way off from home and to top it all off, his relationship with his girlfriend is on shaky ground. As if things aren’t bad enough, he manages to embroil himself in a terrible crime. While the whole town thinks of him as nothing but a basket case, there is one girl who seems to understand him. Now, if only she weren’t so tongue-tied. Being the protagonist, he is expected to follow his heart, win the heart of his dream girl, and be absolved of all crime, which is definitely a tall order for anyone. As for the outcome, only time will tell if he manages to bring his life under control. The book offers a funny take on life, touching on various topics such as learning from one’s experience, standing up for personal values, and helping others in times of need. The Orange Hangover was published in 2012. It has received mainly positive reviews. Rahul Saini is an Indian architect-turned-author. As of July 2012, he has written three books—The Orange Hangover, Just Like In The Movies, and Those Small Lil’ Things. His writing, classified under the contemporary fiction genre, focuses on the vibrant, fun-loving nature of young Indians in the 21st century. It is funny and fast-paced, and clearly aims to resonate with the youth. His books include quite a few references to various television shows and movies. Saini was born on May 8, 1983, in Jalandhar in Punjab, India. In 2006, he graduated as an architect. In addition to being qualified in architecture, he also has sound knowledge of Fine Arts and Design. Saini is involved in various aspects of film-making and photography too. Rishab Suri, a young architect… likes to think out-of-the-box… hates his profession… struggles to figure out what gives happiness… a child at heart… movie buff… funny! Natasha, knows what she wants. She is confident and understanding. Mansi, is silent and an introvert. The title is really catchy the meaning of which is nicely explained in the book itself. I am not going to give spoiler! The cover-page is orangey and nicely depicted. It is a sure eye-catcher. The book blurb is not very interesting. It is too vague. But, the checklists conveys the most and grabs attention. The entire book is from the protagonist’s angle; about his life and thoughts. The narrative is lucid and funny. The chapter heads are catchy and relevant. I also liked the little cartoons here and there. They are cute! The entire book is the hues and cries of a 25 years old man who is not ready to grow up and is unsure about what he wants in his life. It has about 230 pages. The first 100 pages are an assured page-turner. It is witty and there are several laugh-aloud moments. There are two aspects that I loved the most in the book. One is the relationship between Rishab and his mother. It is well-depicted and their bonding is well-established. But, I am wondering why so little is mentioned about his father. Secondly, I liked the relationship between Rishab and Natasha. Their friendship is the most platonic one and she really lives to the saying, “A friend in need is friend in indeed”. I wish that Rishab was a listener too and that he bothered to get to know her. When you are halfway through the book, the redundancy would bore you. And, the climax would make you wonder what the purpose of the book is. Neither there is a premise nor there any interesting incidents. The protagonist thinks a lot, exaggerates even more and over-explains. And for the sake of first half! A detailed review interestingly written.